The Toronto Dingos maintained their undefeated record this weekend after a solid, 5-goal win over the Broadview Hawks on a moist, overcast Saturday at Humber South field. 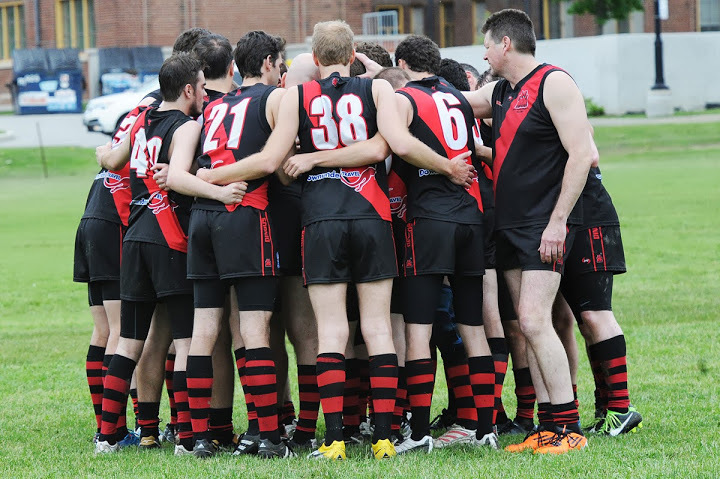 After a tough, back-and-forth first half, the Red and Black pushed through four goals in the 3rd quarter while holding firm in the backline, busting the game open and getting rewarded for some hard-nose footy. The first quarter started off well for the Dingos, who's forwards and midfielders managed to hem the Hawks in their own backline for a solid 10-minute period with a smothering zone coverage. Unfortunately the forwards just couldn't straighten their kicks, and the Hawks managed to survive the onslaught giving up only one goal. The game progressed with a little more back-and-forth action, with the bulk of play coming through the centre while the Dingos half-back line of Yoni, Pat Bossey and some rotation Aussies (Pickers, Mal, Robbo) held firm and made sure to rebound any attack. The second quarter played much like the first, with the Dingos dominating the play in the Hawks backline while the midfielders played free in the middle, walling the Hawks in. Yet again, the goals didn't pile up the way Coach Robbo (playing in his 50th game) would have liked, and the Dingos headed into the half-time break only a couple goals up. The Hawks made a number of switches in the second half, trying to spread out their major ball-movers in an effort to get this going. 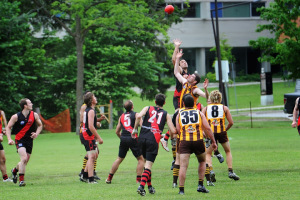 For the Dingos, the task of shutting down the Hawks stars fell to OB (shadowing Cogsey) and Jimmy Duggan, who had taken it upon himself to tag Nick Shuttsy (who had lined up on the wing) and was making every single possession a struggle for the Hawk, despite being a foot shorter. Relief came at long last in the 3rd quarter, as the Dingos finally managed to capitalize on their chances and start kicking some majors. With a fantastic kick on the run, Kyle Morrison had the key goal that seemed to drop the Hawks heads, racing out of a pack on a risky u-turn but using his speed and skills to escape before potting a beautiful goal on the run. Goals by Stewy, Wado and D'Arcy (his first goal as a Dingo) helped the Dingos lift up huge in the 3rd, and took the run right out of the Hawks legs. 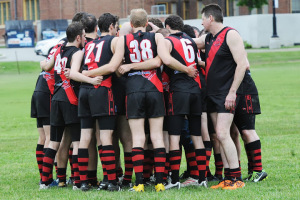 Leading by as much as 7 goals midway through the 4th, the Dingos slowed things down and played some good, solid posession footy, and coasted to a solid 9.9-63 to 4.3-27 victory. BOG honours were given out the Kyle and Jimmy, the former for making key plays in the 3rd that changed the flow of the game, and the latter for battling one of the most talented players in the league, and coming out on top. Link to the detailed match stats can be found here, while league photos taken by Rob Colburn can be found here.